James Whelan Butchers has been honoured to garner many awards recognising our commitment to high standards, local sourcing and unsurpassed taste through the years. Here are some of our favourite accolades. The Great Taste Golden Fork Awards: The Great Taste awards celebrates the very best in food and drink. This year the Great Taste Golden Fork award for the best food from Ireland was awarded to James Whelan Butchers for our Beef Dripping, a product that has also been named Great Taste Supreme Champion 2015. Origin Green. James Whelan Butchers as the Origin Green Verified Member has a proven and measured commitment to sustainability. BordBia Food & Drink Awards 2013: In 2013 James Whelan won the first Bord Bia award for Online Champion which recognizes businesses that have excelled in the digital space. 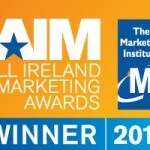 All Ireland Marketing Awards: James Whelan Butchers won the Small Business Marketing Award 2012; a huge achievement as it is chosen from the entire country. In the world of marketing these awards are taken very seriously and considered the ‘oscars’ of the marketing profession. The Bridgestone Guide 2011: The Bridgestone Irish Food Guide honours Ireland’s artisan and specialist food producers ranging from restaurants to farmers’ markets to shops, pubs and artisan foods, this is the most expansive and critical examination of who produces great food in Ireland, where they do it and how they do it. Good Food Ireland: Good Food Ireland is a beacon for all lovers of good food. It is a network of places that make, sell or serve good food as well as those providing quality accommodation. All Good Food Ireland establishments are run by people with a passion for what they do. Irish Web Awards: The Realex Payments Irish Web Awards are held annually to recognise people who do great things on the web. The awards are judged transparently and are open to anyone in Ireland. James Whelan Butchers are the proud winners of the 2010 Best SME/Small Business site. Eircom Spider Awards: The eircom Spiders Awards are an annual event honouring Irish individuals and organisations for their outstanding achievements online and celebrating the successes of the Irish internet and digital media. James Whelan Butchers are the proud winners of the Retail Excellence award at the 2010 Eircom Spider Awards. Rick Stein’s Food Heroes: In 2008, celebrated chef Rick Stein, OBE, toured the UK and Ireland in search of the islands’ top specialist food producers for the BBC series and accompanying book. James Whelan Butchers was delighted to be included among the Food Heroes who are the stars of the TV series and Food Heroes books. South Tipperary County Council: In 2005, Pat Whelan, director of James Whelan Butchers, was awarded the inaugural South Tipperary Entrepreneurial Award by the South Tipperary County Council. Clonmel Chamber of Commerce: In 2008 Pat Whelan, director of James Whelan Butchers, was awarded the Business Person of the Year award in recognition of setting up the Tipperary Food Producers Network. SFA National Small Business Awards: In 2006 James Whelan Butchers won the ‘Outstanding Small Business’ award sponsored by O2. This award recognized James Whelan Butchers outstanding achievements as a small business. Retail Excellence Awards: In 2002, 2006 and 2016 James Whelan Butchers were awarded the Retail Excellence Ireland Award. These awards were established in 1997 to promote best practice standards in the Irish Retail Industry.